CAMWS offers two awards for excellence in teaching. Kraft Award for Excellence in Secondary School Teaching recognizes outstanding teachers of Latin in public or private schools (middle schools included). 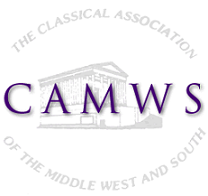 The CAMWS Award for Excellence in College Teaching recognizes outstanding teachers of the Classics in college or university. Both full- and part-time teachers (who teach at least half-time with a mininum of five years teaching experience) are eligible for either award. All nominees must be current CAMWS members. These awards are made annually. The recipients are announced at the annual CAMWS meeting and each receive an award of $500. Honorees are encouraged to accept their awards in person at this meeting. The nomination deadline is November 15, 2018. The deadline for receipt of all application materials is December 20, 2018. For further information about the award for middle or high school teachers, please go to Kraft Award for Excellence in Secondary School Teaching. To make a nomination, go to this Online Nomination Form. For further information about the award for college teachers, please go to CAMWS Award for Excellence in College Teaching. To make a nomination, go to this Online Nomination Form. These awards are made by the CAMWS Subcommittee on Teaching Awards. The chair of this subcommittee can be reached at teaching@camws.org. The 2017-2018 recipient of the CAMWS Award for Excellence in College Teaching was Jeanne Marie Neumann of Davidson College in North Carolina. Her citation can be read here. The 2017-2018 recipient of the Kraft Award for Excellence in Secondary School Teaching was Jessie Craft of Robert B. Glenn High School in Kernersville, NC. His citation can be read here.